The Oppo R17 was made official earlier today with a Snapdragon 670 chipset. 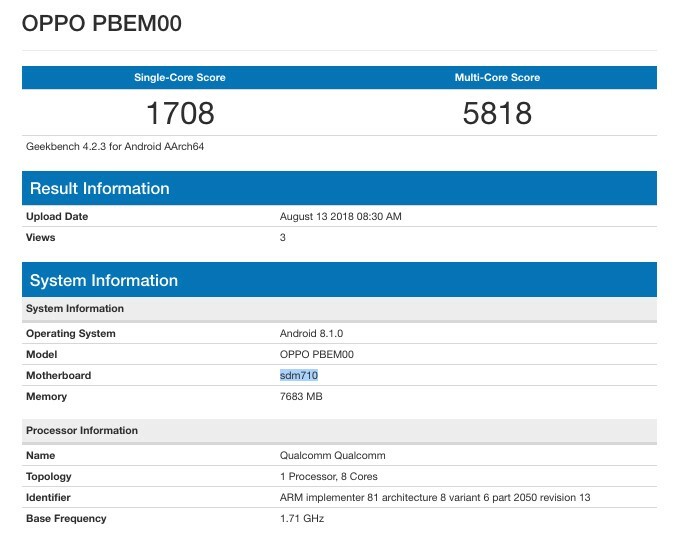 But 3C says that there’s a Pro version coming as well, something that Geekbench just confirmed. What the Oppo R17 Pro brings is a Snapdragon 710 chipset – essentially the same hardware, but with higher clock speeds. The benchmarks match what we expect from an S710 chip, but the 670 is too new and there are no reliable scores yet. The RAM capacity is the same – 8GB. There might be more storage, Geekbench doesn’t say. Though going higher than 128GB for the base model seems unlikely. This may be region-dependent, however, as TENAA claims the RAM is 6GB. There will be a flash sale of the Oppo R17 on August 18 (this Saturday), but it’s not clear if we’ll get official info on the R17 Pro model by then. Perhaps not as it will steal the spotlight away from the base model. Fact is that Qualcomm is not selling his own smartphone with his own chip inside like wawai is doing...some people should think before talk sht over internet.